"As more of us indulge our passion for local, organic delicacies, a growing number of Americans don’t have enough nutritious food to eat. How we can bridge the gap." Many of us celebrated Thanksgiving recently, probably enjoying a bounty of food, possibly including some local and/or organic foods. Some of us might have turned up our nose at boxed stuffing, boxed potatoes, canned vegetables or similar such items. For others though, such foods played a central place in their dinners, if they could even afford that much. It is very disturbing that in our plentiful country, there are still so many people who cannot afford adequate food. You should read a new article in Newsweek magazine, "Divided We Eat," by Lisa Miller. It is a disturbing look at how: "Food has become the premier marker of social distinctions, that is to say--social class." It also offers some suggestions for changing this situation. About 17% of Americans are "food insecure," meaning that they sometimes run out of money to purchase food or they run out of food before they can obtain more money. That is almost 1 out of 5 people, a significant problem. Food insecurity is higher in the South, in big cities, and families headed by a single mother. This has led to a 58.5% increase in food stamp use over the last three years. But that also seems to go with increased obesity, and a recent study has shown that women and children on food stamps are more likely to be overweight. It is not a matter of nutritional education. "Lower-income families choose sugary, fat, and processed foods because they're cheaper--and because they taste good." Even though some low-income neighborhoods are "food deserts," lacking a significant supermarket for fresh produce and such, others are not, and there is little difference in the buying patterns of these low-income people. Michael Pollan stated: "Essentially we have a system where wealthy farmers feed the poor crap and poor farmers feed the wealthy high-quality food." I have mentioned it a number of times before, that local, sustainable, organic products need to be much less expensive before they can spread to the wider community, before they stop being elitist. That is not easy to accomplish and will require a united effort on many fronts. Some efforts are being taken on the local level, such as efforts to allow food stamps to gain extra credit at farmers' markets. But much more needs to be done, starting with a greater awareness of the issue. If local is so important to us, then helping local people who are food insecure should be important as well. If you are working on this issue, please add a comment and tell us what you are doing. Let us know about some of the local efforts to help in this regard. Silly, short-sighted, narrow minded, politically correct run amok, self-righteous Brookline. Yes, I am a bit peeved at their latest action. At a recent Brookline Town Meeting, they passed a resolution, by a 163-4 vote, banning veal. The resolution urges "...grocers, restaurants, caterers, organizations, and other purveyors of food immediately cease the sale or public serving of veal to the public within the Town of Brookline,..." IT was an overwhelming vote but how many considered both sides of the issue? Fortunately, this resolution has no legal effect and fails in other ways as well. It is even amusing that it won't have much impact in Brookline, as they understood and noted in the resolution by stating that "...few proprietors in Brookline sell or serve veal and hence there would be scant economic implications for local businesses;" So why waste all that the time and energy to pass this resolution? The intent seems to be more for "...raising awareness about the issue and encouraging responsible consumption practices among Brookline residents,.." But I believe they have failed in that regard, as well as ignoring far greater meat issues which will ultimately have a more important impact on their lives as well as the environment. Though some news articles claim that the resolution banned only "crated veal," the resolution did not differentiate and simply dealt with veal in general, which would thus also include humanely raised veal. Why should humanely released veal, such as that produced by Strauss and Azaluna, be banned as well? By grouping all veal together, humanely raised and not, the resolution leads to greater ignorance rather than greater awareness. Not all veal is the same and it should not all be treated similarly. In effect, the resolution creates a stereotype about veal, and that is wrong. The voters would not accept stereotypes in other areas so why accept it here? As for "crated veal," efforts are already in place to eliminate it. The American Veal Association announced plans to phase out the practice no later than by 2017. Because of this, each year, more and more farmers end the practice. In Massachusetts, House Bill 815 was filed in 2009 and aims to ban various matters such as battery cages for egg-laying hens, gestation crates for pregnant sows and veal crates. If passed, it would take effect in 2015. Rather than acting unilaterally, Brookline's veal resolution should have instead voiced their support for House Bill 815. That would have better raised public awareness of the issues, especially where such awareness could lead to legal action and accomplish real results. Instead, Brookline passed a resolution which has no legal authority, and ignores the greater issues. Plus, the Brookline resolution deals only with veal, while House Bill 815, deals with a much broader scope of animal cruelty, including chickens and pigs. Why didn't the Brookline resolution also address cruelty to other animals and not just veal calves? What is the true scope of the veal issue? In reality, it is a much smaller problem than others and it was short-sighted to address only veal in this resolution. First, consider that in 2007, less than 5% of calves were raised in a group environment but only two years later, this number has increased to 35%. So, the veal industry has already taken note and has significantly improved their practices. These figures will continue to improve and the Brookline resolution is really not going to have any impact. Second, each year, less than one million calves are slaughtered for veal, and even less are crated veal. Approximately ten billion animals are slaughtered in the U.S. each year. Ten Billion! So the amount of veal calves is only about .01% of the total, a relatively tiny amount. If you are truly concerned about cruelty and CAFOs, Confined Animal Feeding Operations, then your primary concern should be for chickens and pigs. That is a much vaster problem, far outweighing the veal issue. For example, almost nine billion chickens, kept confined and crowded in tiny cages, are slaughtered each year. That is about 90% of the total animals slaughtered in our country each year, which makes that a major problem, far unlike the veal issue. It is very easy to support a ban on veal, to state you won't eat it any longer, but how many in Brookline would have supported a ban on chicken? I bet a resolution banning chicken in Brookline would never have passed, and the vote would have been overwhelmingly against. So Brookline passes an easy resolution without teeth, attempting to seem enlightened and caring. Yet the resolution fails on several grounds, leading only to greater ignorance as well as neglecting far greater problems. It was a waste of time and effort which would could have been used in so many more beneficial and proactive ways. People should be concerned about the food they eat, but they should also examine all sides of an issue. Relying only on slogans and sound bites accomplishes nothing. You must carefully consider the evidence, asking questions, accepting nothing at face value. Be an informed consumer, not a puppet. Addendum (11/29/10): I must apologize and correct an error in my original post. A Brookline Library Trustee and Town Meeting Member provided me a link to some additional information about the resolution. In the fourth paragraph of my post, I stated that the passed resolution deal with veal in general but that is incorrect. Though the original petition did deal with veal in general, that petition was later amended so that the final resolution dealt only with "crated veal." So my criticisms in that fourth paragraph are not applicable. The fall is the season for Grand Tastings at many wine stores, and they are the perfect opportunity for wine lovers to get the chance to taste a diverse selection of wines from all over the world. A couple weeks ago, I stopped by the Fall Grand Wine Tasting at The Spirited Gourmet in Belmont. There were about sixty wines available for tasting, and there was a 20% discount on all of the wines from the tasting. I needed to stock up a bit on some everyday wines so this was a good opportunity to do so, as well as to taste some new wines. I was happy to see two sakes at the tasting, including the Yoshinogawa Gensen Karakuchi and Bunraku Nihonjin No Wasuremeno Yamahai Junmai (one of my favorites). But I was disappointed that both distributors provided me inaccurate information about sake. I did not correct them, but it indicates how consumers may be getting erroneous information. At least people had the chance to taste the sake, and hopefully some of them enjoyed it enough to buy some. 2007 Gentilini Aspro Classic ($17.99): This is a Greek white wine made from a blend of Robola, Sauvignon Blanc and Tsaoussi. An intriguing flavor with tastes of melon, pear, herbs and a touch of ginger. Crisp, clean and tasty. 2006 Massaya Silver Select ($19.99): A red wine from Lebanon, it is a blend of 40% Cinsault, 30% Grenache, 15% Cabernet Sauvignon, and 15% Mourvedre. Complex, deep red fruit flavors, lengthy finish, moderate tannins, very compelling. 2008 Cedre Heritage Malbec, Cahors ($13.99): A French Malbec with more black fruit flavors as well as nice earthy tones. Very different from many South American Malbecs, and the type of wine which appeals to me. A good value wine. 2009 Ferreira Esteva, Douro ($11.99): Another good value Portuguese wine, with a red fruit aroma, plenty of fruit on the palate, along with a mild earthy taste. NV Marsuret Prosecco ($13.99): An easy-drinking sparkling wine, with pleasant fruit and a clean finish. A good value bubbly which is sure to appeal to many people. 2007 Cianfagna Tintilia del Molise ($39.99): The Tintilia grape is a rare grape native to the Molise region of Italy. It produces dark red wines, and this wine had some ripe plum and blackberry flavors with plenty of dusty spice. An interesting wine though pricey, and something I would prefer to taste again some time with food. I think it would show even better with a hearty dish. Cocchi American Aperitivo ($21.99): This intriguing apertif uses a base of Moscato di Asti and is then infused with herbs, fruit and spices, including cinchona, gentian and citrus. It had a nice flavor, both sweet and herbal, reminding me some of the new artisan Vermouths now on the market, though with its own unique taste. Would be a good mix for cocktails too. 2007 Santome Moro 41 ($12.99): An Italian red blend of Cabernet Franc, Merlot and Raboso Piave. Raboso is an indigenous grape, new to me, so this wine intrigued me. But, the Cabernet Franc was strong, giving the wine a vegetal taste which I disliked. 2006 Wellington Cabernet Sauvignon ($24.99): In Massachusetts, The Spirited Gourmet exclusively carries Wellington Vineyards wines and I got to taste their Merlot, Zinfandel and Cabernet Sauvignon. Though I enjoyed all three, the Cabernet was my favorite. It was smooth, with low tannins, deep fruit flavors and a hint of herbs. An excellent Cabernet at this price point. 2008 Villemade Cour-Cheverny ($21.99): Made from the Romorantin grape, a local white grape, the wine had a strong lemon flavor with a minerally backbone. Kudos go to Jillian, the Wine Director at T.W. Food for being so adventurous with her wine selections. As a lover of niche wines, I really appreciate that Jillian also seems to favor exploring and learning about niche wines. At one of her most recent wine dinners, she presented wines from the Jura region of France, definitely some very unique wines. I have had few wines from this region so it was fascinating to get to taste these interesting wines. The Jura region, located between Burgundy and Switzerland, is a cool climate area and grows grapes including Chardonnay, Poulsard, Pinot Noir, Trousseau, and Savagnin. Some of their wines, such as the famed vin jaune, is made in a process similar in some respects to Sherry. It is also one of the few regions, outside of Spain, where flor yeast develops over wine in the barrel. The flor is different from the one in Spain, but works in a similar way, protecting the wine from oxidation. The vin jaune wines must age for at least six years while the sous voile only age for two to three years. Our first wine was the 2007 Peggy Buronfosse Cremant Rose of Pinot Noir Brut ($20), which is made from 100% Pinot Noir. The winemaker, Peggy, was named after famed ice skater Peggy Fleming. Her husband, an agronomist, took a job in the Jura region and Peggy started working part-time in a vineyard. She found her passion here and eventually purchased a small, organic vineyard and began producing her own wines. This wine was a bit creamy, with delicious red fruit flavors, and only mild bubbles. A very pleasant wine, which should appeal to many people. Nothing unusual here, but still a good wine. This was paired with our first dish, Smoked Sea Scallops with a saffron-onion compote and shallot vinaigrette. The scallops were tender, cooked perfectly, and the flavors worked well together, adding much to the dish. The wine went well with the scallops, nothing overpowering the wine. Next up was the 2006 Peggy Buronfosse “Les Belemnites” ($26), a blend of 70% Savagnin and 30% Chardonnay and it is oak aged. This was an interesting wine, with a strong aroma and a full-bodied taste which seemed to be oxidized, but it was not. It had some nutty notes as well as subtle fruit notes, a little apple and pear. Very enjoyable and a wine that can stand up to heartier dishes, like the Croute Jurassiene which was its pairing. The Croute is a traditional foraged mushroom ragout baked on Levain bread. Its earthy taste went very well with the wine. The third wine was a 2007 Stephane Tissot "Vielles Vignes" Poulsard ($24), made from old vines of the Poulsard grape grown in certified biodynamic vineyards. Poulsard is said to be like Cabernet Franc, which made me a little tentative as I worried that maybe the Poulsard would have too much of a vegetal flavor, but that turned out not to be the case. The wine was light red in color, with an almost musty, gamey smell. That did not come out in the taste though, which had mild, dried red fruit flavors and wild herbal notes. The tannins were moderate and it had a fairly long finish. It was an interesting wine, and really did not remind me of Cabernet Franc. If you are seeking something different, definitely give this Poulsard a try. The entree was a Seared Local Albacore with a black peppercorn cream and winter greens. The silky, tender tuna was not overpowered by the Poulsard, and the herbal notes of the wine went well with the dish. The wine also cut through the cream sauce and was a good pairing. For the ending, rather than a sweet, we had a cheese course, which is always fine by me. We had a Comte from Jura, the Marcel Petite "Le Fort," an unpasteurized cow's milk cheese. An excellent cheese, with a stronger flavor and almost a hint of sweetness. With this cheese, we had the most unique wine of the tasting, the 1999 Jacques Puffeney Vin Jaune ($95). This Vin Jaune comes in a 620ml bottle (called a "clavelin"), which is what is left over after the evaporation of what would have been in a 750ml bottle. It is produced from 100% Savagnin and is aged for at least six years in the barrel, though Puffeney often waits for 8 1/2 years. This had an intriguing aroma with hints of almonds, reminding me of sherry. On the palate, it again reminded me of sherry, especially a manzanilla, as it had a taste of briny apples. There was some more subtle flavors too, a bit of herbal notes, and plenty of complexity with a lengthy and satisfying finish. This is a wine to slowly savor, enjoying each sip. Though I very much enjoyed this wine, it is pricey and an aged sherry, which can offer a similar complexity and experience, will usually be a better value. An excellent meal and interesting wines, part and parcel of the usual T.W. Food experience. The restaurant is located a bit off the beaten path, and subsequently does not seem to get as much attention as is deserved. But it is a worthy destination and you should make the effort to dine there. The high-quality cuisine is creative, and the ingredients are well-sourced, often local. Jillian is doing an excellent job with their wine list, and new wines are added all the time. And they hold plenty of fun events, so what are you waiting for? Did you enjoy a bottle of Beaujolais Nouveau at Thanksgiving? I suspect plenty of people had a bottle on their table. Despite its critics, it is still a very popular choice at this time of year, its simple fruitiness making it desirable to many consumers. The third Thursday of each November is the official release date for Beaujolais Nouveau, the first wine released each year from the Beaujolais region of Burgundy. Made from Gamay grapes, the wine is produced through carbon maceration, where whole clusters of grapes are fermented together over a period of four to five days. This quickly creates a an easy-drinking, fruity wine. The release date is now celebrated across the world, with many special events held all over. This is certainly a very successful marketing campaign, though one without pretension. It is a simple wine and no one is trying to say anything differently. It is intended to be a fun wine, and that is how it is presented. One of the largest producers of Beaujolais Nouveau is Georges Duboeuf, a figure of some controversy. He has his critics, but I think you should look past the criticisms and actually taste his wines. You might be surprised and find that you enjoy his wines. This summer, I tasted a selection of his 2009 Beaujolais wines, including Beaujolais Villages and Beaujolais Crus, and was very impressed with their quality. Thus, I was interested in trying the new 2010 Georges Duboeuf Beaujolais Nouveau. I will admit that I usually buy at least a few bottles of Duboeuf Beaujolais Nouveau every year. It is very popular with my family and friends, and often ends up on my Thanksgiving table. This year, I was invited to taste the 2010 Nouveau at lunch at Brasserie JO, a French brasserie in the Colonnade Hotel. Above,you can see the label, which has a circus theme this year, emphasizing the aspect of fun. Plus, Le Cirque is quite popular currently, a revival likely due in large part to all of the talented performers in these modern performances. The 2010 Nouveau (average price $10) actually seemed very different to me than previous vintages, reminding me more of a regular Beaujolais than the usual Nouveau. First, the Nouveau was very dark red in color, not the lighter shades of previous years. Second, its flavor was deeper and less candy-like than other years. Usually, it is referred to as a tutti-fruity flavor, but this year the flavors had rich cherry and raspberry notes, with only a subtle hint of banana. It was smooth, soft and easy-drinking and paired well with my lunch. It was a simple wine, but seemed a bit more complex than prior vintages. I enjoyed it and would recommend that you check it out. This was also my first time dining at Brasserie JO and I was pleased with my lunch. Their lunch menu has plenty of choices, including Appetizers, Eggs & Crepes, Shellfish & Seafood, Salads, Entrees, Sandwiches and more. Prices for most main items ranges from $12.95-$22.95. I began with the Escargot en Cocotte ($10.95), snails in a garlic butter, and have to say these were some of the best I have tasted. Tender snails with a buttery sauce and prominent garlic flavor. I then chose the Croque Monsiuer ($12.95) for my entree, which came with greens and frites. The sandwich was tasty, though thinner than some others I have had elsewhere. It is a good choice, though still not comparable to my favorite Croque Monsieur. The frites were also tasty, properly crispy on the outside, and soft and fluffy inside. For dessert, I ordered one of the Crépes Magnifiques ($7.95), the Banana-Caramel, and it certainly was magnificent. A quite large crepe, filled with ice cream, topped with fresh banana slices and a sweet caramel sauce. This is large enough for two people to split, and is sure to please. Don't make assumptions and be a wine snob. 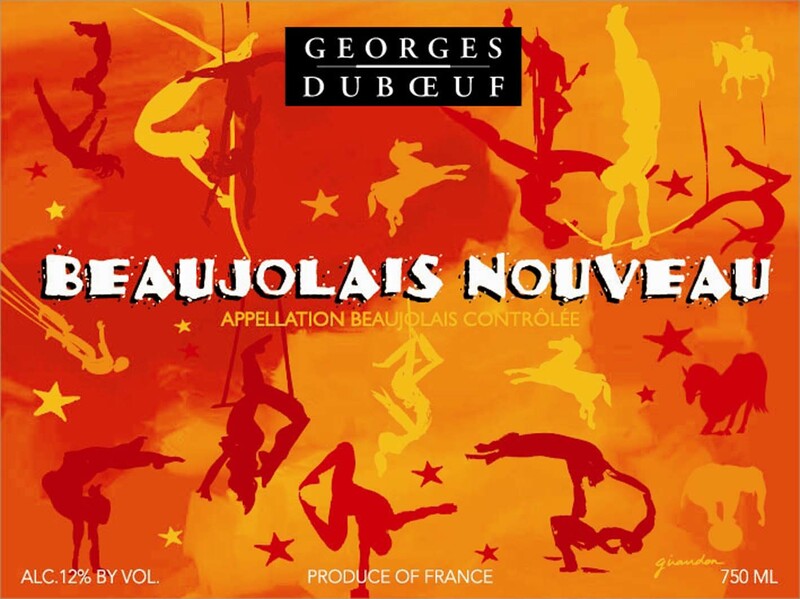 Instead, give the 2010 Georges Duboeuf Beaujolais Nouveau a try. It is a simple and fun wine, and will please the average consumer. And this vintage seems different than previous ones, and is worth a taste. There have been rough episodes for me during the past year, including the loss of two beloved cats, Mosie and Kachina, who were respectively fifteen and fourteen years old. To some, that might not seem to be that important, but pet owners will understand the closeness you can feel towards an animal. But, I did get a new kitten, Kushi, and I am very thankful for his presence in my life. I am very thankful for much in my life, including family, friends, health, and much more. It would take too long to list every single thing here, but I do reflect upon them. And I just hope that others do the same, and not take their lives for granted. Share your feelings with your family and friends. Tell them that you love them, thank them for being in your life. Enjoy fine food and drink this Thanksgiving but remember that it is more than a feast. It is also a time for thanks, for all the good that is in your life. I am here with a special Wednesday edition of Sips & Nibbles, my regular Thursday column where I briefly highlight some interesting wine and food items that I have encountered recently. 1) As part of a series of celebratory events marking their 10-year anniversary, the Beacon Hill Hotel & Bistro is offering “A Decade of Decadence” a 10-day journey featuring special dishes and drinks marking the culinary highlights from the past decade. The journey begins Saturday, November 27 and continues until Tuesday, December 7, pausing only on December 2nd (their anniversary date) for a special champagne dinner. Each night’s special will be offered in addition to the regular menu and reservations are recommended by calling 617-723-7575. Pair your culinary journey with the "appropriate" wine & spirits of the year. All selected wines & cocktails are only $10. 2003: Merlot - the year before it got trashed in "Sideways"
2) Want something new for the holidays? The Ashmont Grill, located in Dorchester, offers a special cocktail recipe for the holidays: Black Cherry Manhattan. This recipe will make enough for a party, which makes it very appropriate for the holiday season. Stir ingredients together in a glass jar with a cover. Allow to rest in a cool, dark place for 5-7 days. Drain solids from liquid using cheesecloth or a coffee filter. Serve in a rocks glass over chipped ice. If desired, garnish with a “lollipop” made of a dried cherry dipped in dark chocolate. 3) Black Friday and Cyber Monday are not just for retail shops. Some Boston’s restaurants are joining in, offering their own special deals. Towne Stove and Spirits will treat you to a signature complimentary Wood Grilled Margherita Pizza with purchase of entrée when you present a receipt in excess of $50 from The Shops at Prudential Center. Towne Stove and Spirits is also the only destination in the city to offer valet services during lunch service. From midnight through 11:59pm on Black Friday and Cyber Monday, Haru Sushi will treat gift-givers to a complimentary gift card of their own. For every $50 purchased in Haru gift cards (available in-store or online at www.harusushi.com), Haru will reward you with an additional $10 gift card. ‘Tis the season of giving, and everyone deserves something this holiday season. From midnight through 11:59pm on November 29th, BOKX 109 American Prime in Hotel Indigo will be giving your gift cards a raise. For every $100 spent, BOKX 109 will bump the denomination up to $120. 4) Tony Coturri of Coturri Winery is coming to town. Coturri Winery, located in Glen Ellen, California, is very well known for being a model for organic wines. I am a fan of his wines and was very intrigued to learn that he is now also working to produce some wines in Texas. So, on Saturday, November 27, from 4pm-7pm, I will be at The Spirited Gourmet in Belmontto meet Tony and taste a selection of his wines, including two from Texas. I have never had a Texas wine so this should be interesting, especially if Tonyis involved. Why not come to Belmont and join me this Saturday. Though it is unlikely I will ever be a guest judge on Iron Chef America, I did have the opportunity this past weekend to be a guest judge for Turner Fisheries' first Seafood Recipe Contest. During the spring, numerous amateur cooks submitted their recipes to Turner Fisheries and ultimately, three finalists were chosen. The Grand Prize is that the winning recipe will be added to Turner's menu, quite a nice achievement. There were four judges, including friends Jacqueline (Leather District Gourmet) and Will (The Boston Foodie). The fourth judge was Chad Kennedy, the Executive Sous Chef at Turner Fisheries. We first got to see the three finalists preparing the dishes, and then we were served each dish, one at a time. It was a bit strange eating with an audience, as the family and friends of the contestants intently watched us, taking photos, and hoping their contestant would ultimately won the contest. But it was still lots of fun, as well as delicious, getting to eat three very good dishes. First Place was awarded to David Copeland for his Mussels with Chipotle Pesto. Tender mussels in a spicy sauce, which would be perfect for dipping fresh bread. Second Place was awarded to Israa Muezzin for her Cod with Onion Lemon Sauce. A dish that should appeal to many people, with a nice balance of tastes and textures. Third Place was awarded to Fiona Coxe for her New England Seafood Salad. A unique twist on seafood chowder, transforming it into a salad. All three contestants worked hard, especially considering they were in a strange kitchen and had a time limit on their efforts. They all deserve kudos for their dishes, and hopefully they will all enter the contest again next year. You don't have to be a professional to cook well. It just takes some hard work and passion. And these three cooks certainly possessed that passion. Are you motivated by money or passion, or in other words, are you a mercenary or a troubador? At a new wine store, I was recently told that they would only carry certain niche wines if their customers requested them. This is a very reactionary, rather than a proactive, attitude, and seems motivated more by financial considerations than passion. You are selling only what is popular, what sells the easiest. It can also be a lazier, and less challenging, form of retail. Contrast that type of merchant with a more passionate one, an advocate for wine who is more proactive in their efforts. A Troubador. They carry plenty of niche wines, even if none of their customers requested them. Rather, they try to expose their customers to these wines, to broaden their palates. They hold tastings which showcase the more unique wines, letting consumers learn and love them. This takes more effort, and can be very challenging, but it can also be more satisfying. And if you possess a true passion for wine, the effort is worthwhile. Consumers don't always know which wines they will enjoy. Sometimes they possess mistaken preconceptions about certain wine types, thinking that they won't like those wines. For example, many people think all sherry is sweet, not realizing the myriad joys and diversity of dry sherry. Other people think all sake is served hot, not understanding the deliciousness of chilled sake. So, those people won't ever ask a wine store to carry those items. Yet if those same people were exposed to the truth, if they tasted dry sherry or chilled sake, then they might find they actually enjoy them. Thus, by relying only on what your customers request, you do a disservice to them. You cater to their misconceptions, preventing them from encountering other wines they would savor. Troubadors though share their passion and knowlege with their customers, exposing them to new wines, to new tastes. And customers become very grateful for that, pleasantly surprised when they find something new to treasure. They are also more likely to return, to see what new treasures you have to offer. Even when a Mercenary carries some niche wines, how they handle them reveals their true nature. Such a wine store owner will simply place the niche wines on a shelf, often without even a shelf talker, and hope they sell themselves. They exert little, if any, effort to promote those wines, just expecting customers to buy them. Plus, the niche wines these owners stock are usually not the best examples of such wines. They are often the cheapest examples, and the quality is consequently low. Certainly not the type of wine that would appeal to someone new to such wines. These niche wines require more hand selling, more promotion, more tastings. Consumers must be educated about those wines, shown the errors of their preconceptions. Plus, it is much more persuasive to consumers if the wines they taste are actually quality wines, and not just some average, at best, sample. Give them a niche wine which will impress, not one that is instantly forgettable. One of the problems may be that the Mercenary owners are not educated about niche wines and they don't have sufficient motivation to learn about them. So, there is less incentive for them to carry such wines, and there would be difficulty anyways promoting the wines because of their ignorance. The Troubadors take the time to learn about new wines, to expand their own knowledge base. They themselves enjoy the thrill of discovering new and compelling wines. I praise the Troubadors out there, those who spread a passion for wine. They are the ones who receive most of my praise and support. One of the most significant trends in local wine stores is the rise of discount wine stores, often warehouse-like places with very low mark-ups on their wines. I think more of these stores will open in the near future, and such stores will then need to work hard to differentiate themselves from the competition. Their low prices alone will not be a compelling enough reason. The Wine Bunker, which just opened in Reading, is another of these discount wines stores and I dropped by recently to check it out. Please remember that this store is brand new and I am offering only my initial impressions. Matters could change, and hopefully for the positive, over the next few months. Back in August, I provided some preliminary information about this store, some of which has changed though nothing too significant. Though the store has somewhat of a warehouse feel, it also has nice wooden wine racks and display units. It is spacious with a good amount of clear space between the aisles. To the back of the store, they constructed a tasting room, though I did not see it. It should be large enough though for larger tastings, classes or private parties. Though I was previously told they would only sell wine, they have decided to expand their selection to include beer and spirits. They still are adding to their spirits selection, though you should be able to find many of the most popular brands. I randomly looked at the price of their Grey Goose (750ml) to see how it compared to other stores. Wine Bunker had it for $32, which seemed a bit high to me. I checked and found that Kappys carries it for $31, and has it on sale for $27. The store carries about 1000 wines and will be bringing in some more. The wines are generally categorized by country or wine region, though they need some signage to indicate where each group of wines is located. Individual wines also mostly lack shelf talkers. Plus, I found the Spanish wines in two separate locations, though there was no apparent reason for the division. Wine prices are discounted from what you will find at many regular wine stores, and often on par with other discount wine stores, though there is some variation. For example, you will find the 2008 Caymus Cabernet Sauvignon for $58, an excellent price, though the 2008 Caymus Conundrum is $23.25, where other discount stores may have it for only $18. Though they had pondered offering a case discount, they chose not to go with it, which is typical for most discount wine stores. The wine selection varies, with the most popular wine regions commonly have the best variety. So there are plenty of California wines, from the most popular ones, to some less common but also compelling. For example, they carry the 2008 Hirsch Vineyards Bohan-Dillon Pinot Noir ($27.25), which is an excellent wine, though not something found at many other discount wine stores. You will also find some higher-end Cabernet Sauvignons, including Duckhorn, Heitz, and Caymus. In addition, they have a good selection of wines from Washington and Oregon, and will be adding more in the future. The Pacific Northwest appears to be one of their passions, and a location where they feel is very good value. The Wine Bunker carries nearly the entire portfolio of wines from 90+ Cellars, which is a good thing as they have some excellent, value wines. Though you can find these wines on the wine racks, they also have the above unit which showcases all of their wines. I have written about these wines before, and found some true treasures in their portfolio. On the negative side, the store is lacking in a number of niche wines, and has limited options for some other wine regions. For example, though they have maybe 30+ Spanish wines, only one costs over $20. So they lack any higher-end Spanish wines, such as the best from from Rioja and Priorat. There are only three, inexpensive Portuguese wines as well as maybe five, inexpensive South African wines. They do not carry any Greek wines, Israeli wines or Sherry. There are only three Sakes, and none that are particularly interesting or excellent. When I asked about some of the missing niche wines, I was told that there were no current plans to bring in them to the store. Instead, they would wait to see what their customers requested, to determine whether people would ask for Greek wines or sherry or not. I countered that customers may not always know which wines they might like. For example, most people might not request sake, but it is certainly something they would enjoy if they were exposed to it, if they got to taste some delicious, premium sake. Thus, they should be exposed to unfamiliar wines, to get them to broaden their palates. I raised this issue in a discussion on Facebook, without naming the store, and an employee of the Wine Bunker responded. But, she essentially changed what I had been informed hours before, in her presence, at the store. Now, the store allegedly will start carrying some of those niche wines, such as Greek wines, without waiting for customer requests. We shall see what develops. There is a Grand Holiday Tasting Event scheduled for Saturday, December 4, from 2pm-6pm, which should have over 60 wines available for tasting. They will be holding regular tasting events but have not yet worked out a schedule. On their website, which apparently is still being changed, you can order numerous wines, though they all appear to have a tiny clock on their listing. Previously, that clock indicated there was a need for a "3 day lead-time required to confirm availability." That has since been changed to a 5 day lead-time. Corporate Wines used to do something similar, and ran into some complaints about the process. I was informed that the system was different now, more in sync with the distributors, so maybe there will be less times when the wines you order are not available or the price has changed. Overall, I see this wine store as a place of great potential, but whether it meets that potential or not remains to be seen. More signage, including shelf talkers, needs to be added. Pricing needs to be more consistent, so that the wines all have similar discounts. Currently, some prices are very good while other wines you can find cheaper elsewhere. The selection needs to be improved and expanded, carrying more variety and niche wines, especially if they want to attract the more experienced wine lovers. Archaeologists seem to be continually pushing back the dates of origin of many different items. Additional digs, new technology, and expanded analysis all contribute to gathering new evidence and information about such origins. I find the subject fascinating, especially when it relates to food and drink. When did chocolate originate? It is widely agreed that chocolate originated in Mesoamerica but the date of its origin has recently been significantly revised. In the latest issue of Archaeology (Nov/Dec. 2010), there is an article, The Power of Chocolate, written by Blake Edgar, a senior editor at the University of California Press and a contributing editor to Archaeology magazine. In 1984, chemists at the Hershey Company analyzed the residue in an ancient clay pot, trying to ascertain whether they had contained cacao or not. They determined that the chemical theobromine was the perfect indicator of whether cacao was present or not, and found some in the pot, which was aged to 460-480 A.D. At the time, this was the earliest known evidence of cacao use. Since then, other pots have undergone similar analysis, and the earliest evidence for cacao use has been pushed back, to at least 1500 B.C., and likely is even older. So, in just 20 years of analysis, the origin date of chocolate has changed by about 2000 years. It is a fascinating article, and supplies some additional information about the role of cacao in Mesoamerica so I recommend you pick up the latest issue of Archaeology. Their website only has an abstract of the article so you need the actual magazine for the entire article. 1) I have predicted that Sherry is going to make a comeback, part of its cyclical nature, a 3000 year old history of ups and downs. No matter how low sherry has fallen, it has always found a way to rise back to the top. Though sherry has been at a low, there are signs that may be changing. A recent news article in The Telegraph, called "A Fino Thing," notes a significant surge in UK sales of sherry. The huge chain Marks & Spencer reported that their sherry sales have increased 18% within the past year, remarking that younger drinkers have been embracing sherry. That is certainly what is needed, a new generation to accept and savor sherry. 2) The new issue of Decanter (December 2010) discusses sweet sherries, stating how they are good for Christmas time. Sarah Jane Evans MW provides twelve specific recommendations, including Oloroso, Pedro Ximenez and Moscatel, and ranging from Bodegas such as Gonzalez Byass, Lustau, Harvey's and Hidalgo La Gitana. She notes that "All of these sweet wines echo the flavours of mince pies and Christmas pudding..." In the next issue of Decanter, they will cover dry sherries. Great to see sherry getting more coverage in the major wine periodicals. 3) With Thanksgiving coming this week, I am trying to decide on which sherry to open for my turkey and venison feast. I am tending towards a dry Oloroso, probably a VORS (30 year old), which should pair well with both poultry and wild game. I will have some other wines too, but the sherry will be the center of the dinner. I will report back on how it works out. 1) This Black Friday, Legal Sea Foods is giving everyone the chance to “See fish fly!” From midnight through 11:59pm on November 26th, Legal Sea Foods will take 20% off of everything purchased at their online fish market with the code IEBLKFE2T (excludes gift card purchases). 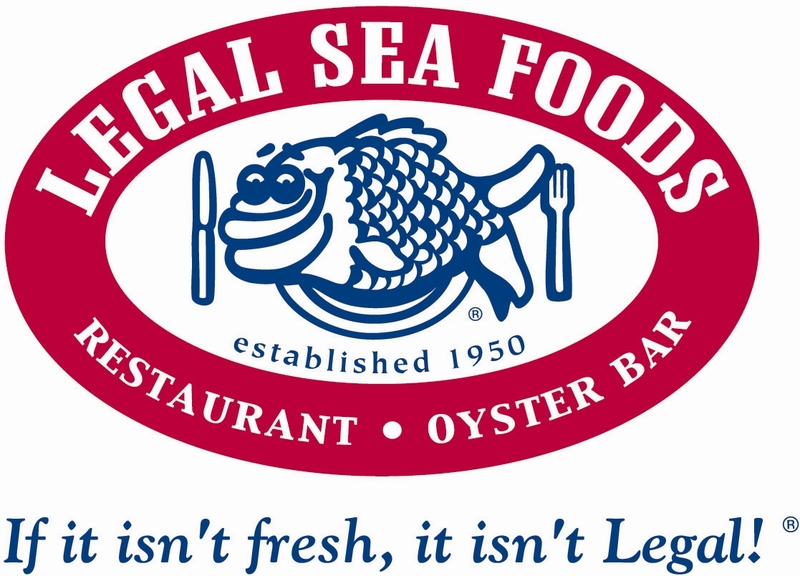 Legal Sea Foods offers a vast selection of fresh fish and shellfish products (plus more!) where you can schedule a delivery online coast-to-coast and enjoy an outstanding gourmet dinner at home, or send to a friend, colleague or loved one. Legal Sea Foods offers an array of goods from the following categories: Lobster Packages; Butcher Shop; Shrimp Packages; Surf and Turf Packages; Mini Appetizers; Desserts. Legal Sea Foods also offers Corporate Gourmet Gifts with their award-winning dishes. HOW: Visit the online fish market at: http://www.shop.legalseafoods.com/. 2) Join Gordon’s Fine Wine & Liquors for their annual and complimentary luxury wine tasting with Horizon Beverages, the largest wine, beer and liquor distributor in New England, for a complimentary tasting of wines that you’ve always dreamed of drinking. On Saturday, November 20, from 1pm-4pm, Gordon’s will uncork some of the most well-known, exclusive wines out there while guests sample complimentary hors d’oeuvres from Chef Paul Turano of Tryst Restaurant. Over 50 high-end bottles of wine will be opened for your personal tasting pleasure including Taittinger, Jadot, Darioush, Frescobaldi, Taylor Fladgate, Joseph Phelps, Masi, Banfi, Delectus, and more. RSVP: No registration is required for this walk-around, complimentary tasting. For more information visit www.gordonswine.com, or call 781-894-2771. With Thanksgiving coming next week, you might be thinking about which dishes to serve for your feast. You might be making your old favorites, or you might be seeking something different. If you want to try something new, as well as easy, let me offer some suggestions. I am compiling here links to several recipes I have posted over the years, recipes which would be perfect for any Thanksgiving dinner. These are all easy recipes for cooks of any skill level shouldn't have problems making these dishes. Buffalo Chicken Dip: This always seems to be popular whenever I bring the dish to a party. Lots of cheese, spicy sauce and chicken chunks. Get a big bag of tortilla chips and just scoop up some of this dip. You can make it the day before and just warm it up being serving. Sangria: Rather than a punch, make up a batch of Sangria instead. Based on the recipe from Dali, this is a compelling drink and you'll probably end up with an empty pitcher by the end of the evening. Double Corn Pudding: This is an easy substitute for home-made corn bread, and there are never any worries that it will be too dry. It is very adaptable too, and you could easily add some of your own special ingredients, such as jalapenos or even bacon. Special Potato Casserole: Rather than the usual mashed potatoes, or even mashed sweet potatoes, try something which has a little of both. With the addition of goat cheese, these potatoes become especially creamy and tasty. Swedish Apple Pie: Making pie crust can be a chore, so why not make a pie which creates its own crust? This recipe is a big time saver, and it does not skimp on taste. Top it with your favorite ice cream, whipped cream or cheese. Despite dire predications about the death of magazines, niche magazines still seem to be thriving, with new magazines being started all the time. While perusing the magazine racks at Barnes & Noble, I came upon Cooking Wild, a new quarterly publication that "...was created to bridge the gap from the field to the table. 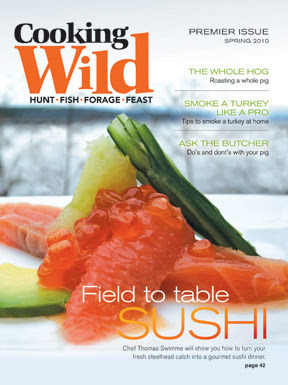 Each issue will cover all things important to the food-focused outdoors person - hunters, anglers, and foregers alike." The contents intrigued me so I purchased an issue, later buying its premiere issue too. So far, only 2 issues have been released, the latest issue costing $6.99 for 52 pages. I was pleased to see, unlike many other magazines, that most of the issue was content, with only a small percentage dedicated to advertising. The publisher is April Donald, whose husband hunts and fishes, and most of the articles were written by sportsmen and chefs. The photography is compelling, though if butchery scenes turn you off, then you should beware. For me, I enjoyed all of the pictures, finding they added much to the articles. The well-written articles cover a diverse selection of topics, including cocktails, wine, butchery, knife selection, mushroom foraging, cooking advice and recipes. They also cover a wide range of animals, including geoduck, venison, elk, rattlesnake, duck, wild turkey, crawfish, buffalo, and much more. There are approximately twenty recipes in each issue, including appetizers, entrees, and sauces. Some of my favorite recipes include the Chicken Fried Duck Breasts, Spicy Ketchup, Jean Skrak Buffalo Flank Steak Marinade, Tea Smoked Rattlesnake, and Molasses Cider Barbecue Sauce. Even if you do not hunt or fish, much of the magazine will still be useful to you. As butcher shops like Savenor's and The Meat House sell exotic meats, you can find what you desire there, using recipes found in the magazine. I love wild game and have purchased meat from both locations, which albeit expensive, is worth the price. Broaden your horizons and try some exotic game. This magazine makes an excellent resource for recipes for such meats. In addition, the recipes are very adaptable and you could use them for other meats too. I strongly recommend this new magazine, and think many cooks and food lovers will find much of interest and value within it. In many ways, the food and wine world has become very complex, especially when you consider the vast choices we now have. In addition to that diversity, there is an assortment of other issues involved, from sustainability to "natural" wines, which only add to the complexity. We want to know about these matters but it can be overwhelming for the average consumer, and even for more educated food and wine lovers. The key question is always: Who can you trust for accurate information? That cannot be easily answered. In the end, it is an assessment based on various factors, including a source's motivations, biases, knowledge base, experience, passion and more. It is a crucial assessment if we want accurate data, if we want correct and honest information. If these matters are important to us, then it is our duty to seek the truth, or at least as close as we can get to the truth. If you want information about a wine, who do you trust? A distributor, a wine store employee, a professional wine critic, a wine blogger, a friend? Distributors and wine store staff have a financial motivation to sell wine, which could bias their opinion. Other biases exist which could affect the other potential sources of wine information. Does a blogger only review free samples? Then their opinion might be biased, in order to continue receiving free samples. In addition, all of these sources will have different levels of knowledge about different wines. At a tasting yesterday, two distributors gave me inaccurate information about Sake, so I would not trust their knowledge in that regard. If you want information about sustainable seafood, who do you trust? A fisherman, seafood purveyor, marketing company, professional writer, blogger, etc.? Once again, some of those will have a financial motivation and that could taint their opinions. Others may have their own biases which need to be taken into consideration. Sources will also have different knowledge levels, from scientists to informed citizens. I have seen marketers claim a seafood is sustainable, though by examining other evidence, it appears the marketers were not correct. The key to discerning an accurate source is to question everything. Question their motivations, their knowledge level, their biases. Don't accept anything at face value. Yes, it takes more time to do this, but it pays off in the end by providing you better and more accurate answers. And that questioning can help you trust your source more. For example, the longer you follow a blogger, the better you will understand them, and the better you can assess their biases, preferences, and knowledge level. That will lead to a better bond of trust. Besides questioning everything, you should also consult other resources and not just a single one. The more references you consult, the better your chances of getting accurate information. You could ask a single seafood purveyor about their practices, but they might not give you the full truth. But, by consulting other references, you might learn matters your purveyor failed to mention, or of which they were erroneous. With the information overload found online, please remember that not everything can be trusted. Question everything, and seek as many references as possible. Trust and accuracy comes with time and effort. The Porter Exchange, in Porter Square, Cambridge, is one of my favorite destinations, and has a collection of small, Asian restaurants and shops. Though I still miss Kotobukiya, the Japanese grocery store which was once there. Yesterday, the Exchange held their first Japanese festival, with several ongoing activities as well as special events. I dropped by for a couple hours and had plenty of fun and delicious food. Hopefully, they will hold more such festivals in the near future. My favorite of the Porter Exchange eateries is Tampopo (literally translated as "dandelion"), which only has four small tables and a short counter. It is inexpensive and the varied food, from tempura to kara-age, from maki to soboro bowls, is very tasty. Before attending the rest of the festival, I stopped at Tampopo for some lunch, fortunately getting there before it got too crowded. With such limited seating, there is often a line at prime dining times. I savored some shrimp shumai, miso soup, and spicy chicken kara-age, a few of my usual choices. The restaurant is consistently good, and nearly everything costs less than $10. I also stopped by the Japonaise Bakery, to pick up a few of their alluring baked goods, including shoku pan, a thick white bread which is perfect for French toast or grilled cheese, and blueberry scones. In addition, I enjoy others of their pastries and baked goods, including their sugar donuts, croissants, and sticky buns. One of the festival tables offered green tea, including in an abbreviated tea ceremony. The attractive woman above mixed the powdered tea with a whisk, each action carefully conducted. The tea, which I sipped from the bowl, was quite good, with that strong and earthy quality you can find in other green teas. Some of the other tables had water balloon fishing (Yo-yo Tsuri), brush and ink calligraphy (Shuuji), and origami. One of the special events was a music and dance performance by Sumie Kaneko and Michiko Kurata. Sumie played a Koto (pictured above) and Shamisen. This is a dragon koto, a member of the zither family, and Sumie began learning how to play it when she was only five years old. The shamisen is placed into the lute family and resembles a banjo in some respects. Sumie played a few songs, even singing at times, while Michiko danced a couple times, once a more formal and slow dance while the other being a more joyous and active dance. Both women were very talented and the performances were quite compelling. I have a couple videos but have been unable to upload them yet here. I will add them when I find a way to do so. Later performances during the day included Aikido, Origami and Wadaiko (Japanese Drum). 1) The Wine Bunker, a new wine store in Reading, should be opening soon, a little later than originally expected. I previously discussed this new store, and do have a couple updates. They they will be carrying some of the 90+ Cellars portfolio, which is a good thing as they have some excellent, good value wines. Their website is now up and it is interesting. Though they are connected to Corporate Wines in Woburn, they don't have a link to it, or even mention that fact. The Wine Bunker site lists many wines available for sale, but they all seem to have a tiny clock on their listing. That clock indicates a "3 day lead-time required to confirm availability," meaning the wine may be available from their suppliers and they have to check on the availability. Corporate Wines used to do something similar, and ran into a number of complaints about the process. It can be frustrating if you order a wine and it is not available, or the price is higher than quoted. They subsequently removed such ordering from their website, but now have apparently resurrected it for their new store. I am curious how the process has changed, if at all. As soon as the store opens, I will check it out. 2) I am a big fan of brunch and apparently The Langham, Boston, has quite an extensive one, the City Brunch. Executive Chef Mark Sapienza offers a variety of locally sourced and produced foods, in addition to house-made items. Chef Sapienza has a direct relationship with local farmers and artisan food purveyors to offer the best meat, seafood, cheese, fruits, vegetables, and herbs. New this year, City Brunch will feature a Bloody Mary and Mimosa Bar. City Brunch is every Sunday from September 12, 2010 through June 26, 2011. The price is $48 for adults and $25 for children ages 5 to 12. Reservations are strongly suggested and are available at 11:00 a.m., 11:30 a.m., 1:00 p.m., and 1:30 p.m. To make a reservation for City Brunch, please call 617.451.1900, extension 7125. Make reservations early for Thanksgiving Brunch (November 25), Sunday Holiday Brunch with Santa and carolers (November 28, December 5, 12, 19, and 26), Christmas Brunch (December 25) and Recovery Brunch (January 1). Special holiday event pricing may vary. Please reserve early for holiday events. 3) Featuring a menu designed by Chef Rachel Klein, Aura will celebrate Thanksgiving with an elaborate Buffet Brunch, with two seatings. What better day than Thanksgiving to celebrate family dining, in a way that kids and parents can enjoy great cuisine without the distractions of the cooking and cleaning; just enjoying the family in a friendly, relaxed environment. The cost for adults is $65 plus tax & service; for kids: $24 plus tax & service. All children 6 and under are free. Pre-paid reservations can be made at 617-385-4300. "There is not a recipe without a story." You will find some cookbooks which are merely compilations of recipes, very functional books but some would say they are missing a soul, a heart that elevates them beyond the usual. Then there are others which take the time to explain the origin of the recipes, the stories behind them. Those cookbooks are far more compelling, providing a foundation that bolsters the impact of those recipes. At the Chefs Collaborative National Summit, I attended a panel of food-book authors, one of which was Lynne Christy Anderson, a local author. Lynne lives in Jamaica Plain, teaches at Boston College and Bunker Hill Community College and wrote Breaking Bread: Recipes and Stories from Immigrant Kitchens. While teaching English to immigrants, she found a significant way to connect with them was to discuss food, and the students shared their tales of food, family and friends from their native countries. This was the inspiration for her book, providing recipes and the stories behind them. Lynne is the source of the quote at the start of this post, and her words resonated with me. As I pondered her words, I also thought about those cookbooks I most enjoyed. I found that those that provided a story behind the recipes were those that stood out the most to me. That connection to the people behind a recipe, that insight into their lives, was fascinating to me. We can relate to those recipes far more than a clinical list of only recipes. It certainly makes sense, in many related topics as well, such as wine. The most compelling wine reviews don't merely provide the technical details of the wine. Instead, they share a story about the wine, relating details of the wine region, the wine maker, the grapes, and much more. It is those stories which best hook a reader, which are most likely to lead that reader to try the wine. When I talk to wine store owners about Sake, an intimidating beverage for many, I advise them to tell stories about the Sake, to draw in their customers. A customer may not remember Sake terms like Junmai and Ginjo, but he probably will remember the brewery that is over 800 years old. I try to inject those stories into my own writings, though I probably don't always do so. But maybe this will spur me on to be more diligent in that respect. It should stand as advice for all writers, the way to make their work more memorable and compelling. Tis' the Season of Gluttony and heaping platters of food and overflowing pitchers of various drinks will grace tables all across our country. The blogs will be full of tales of epic dinners, exceptional bottles of wine, and huge, whipped cream covered desserts. You will find tons of holiday recipes, how to prepare some of the most decadent dishes. The photos will display these hedonistic pleasures in all their alluring glory. But I want to see something more. No, I don't want to surpass those gluttonous images. Instead, I want to read about some efforts to help those less fortunate. This should be a time of generosity and charity, of giving to others rather than gorging ourselves. Though many love the holiday season, it can be a sad time for those with little or nothing. Share your largess with others, helping those who truly need it. During this season, there are numerous restaurants, chefs, stores and others which are holding special charitable events. Promote those events on your blogs, spreading the word far and wide. Attend those events, encouraging others to do the same. Give to your favorite charities, whatever they might be. Just don't revel in gluttony, ignoring the plight of others. Sure, I will probably over indulge this season and I may even discuss it on my blog. But I won't forget others who cannot do the same. And I will do my part to help these people, to share what I possess. 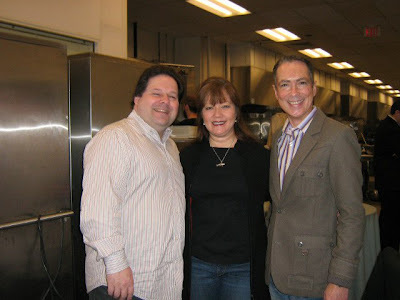 Year round, I promote numerous food and wine-related charitable events and probably will promote even more this season. I will give to several charities as well, those which are personally close to my heart. I encourage all of my fellow bloggers to do the same this season. Don't be merely a glutton. 1) Let me announce the opening of my new Saké website, Passionate Sake, which is dedicated to my Saké business endeavors. As a Certified Saké Professional, I am available for hire to host educational classes, tastings, dinners, and much more. Wine stores, distributors, restaurants, school and private individuals can all benefit from my services. Though the new site is only in its beginning stages, it will grow to become an interesting Saké resource. You can also follow my new Saké-centric feed on Twitter at @PassionateSake. Right now, you can read my new and valuable article, Ten Ways Wine Stores Can Sell More Sake. This is an excellent list of suggestions by which wine stores can capitalize on the growing consumption of Saké. Why let your Saké just sit on the shelves gathering dust? Instead, learn the best ways to sell it, to entice your customers into wanting to buy Saké. 2) My next Saké educational class will be held on November 16, from 8pm-10pm, at the Beacon Hill Wine & Gourmet in Melrose. This will be the perfect opportunity to learn about the basics about Saké, as well as to taste some intriguing Sakés. What do virgins have to do with early Saké? What is the difference between a Honjozo and a Junmai? What is a kegani and why does someone drink Saké from it? These questions and much more will be answered and explained. Space is limited so please contact Rebecca at 781-665-3332 to make your reservation. Tempura, properly prepared, is an exceptional delight. A light, clean, crispy coating over shrimp, sweet potato, carrots and more. It is also a measuring stick I use with Japanese restaurants, to assess their quality. Can they make good tempura? If so, I bet the rest of their food will be equally as delicious. On my last visit to Haru, a Japanese restaurant below the shops of the Prudential Center, I had issue with their tempura. The tempura batter was too thick, maybe overcooked, and felt spongy when I touched it. The matter was brought to the attention of their General Manager Michael Slavin, who stated. "After researching our Tempura Batter recipe, I found out we were not adding enough liquid to the batter. This is totally an oversight on my part. We have since modified our recipe to reflect what every other Restaurant in the Haru concept does; 4 parts tempura batter to 4 parts water and 1 part soda water (previously it was on a one to one scale). Since “revising” our in-house recipe, the consistency is much lighter and crispier on all of the Tempura items." So I recently dropped by for lunch, to determine whether the tempura had improved or not. I ordered the Chicken Teriyaki lunch box ($13.75), which includes a California roll, 2 shrimp tempura, white rice and miso soup or salad. In fact, the box also had three pieces of veggie tempura, including a sweet potato. The shrimp tempura has definitely improved, and was much lighter and crunchier than my prior visit. It was now a proper tempura, though it technically still could have been a bit lighter. The veggie tempura were perfect, so they could make their shrimp tempura even better. But it is still very good and they certainly have made the necessary changes to their recipe. I would order it again on my next visit to Haru. The rest of the lunch was very good too, as well as the service. Thanksgiving wine recommendations are ubiquitous at this time of year. But too many of those articles simply promote the same old type of wines, year after year. Even when they stretch the boundaries a little, they often don't stray too far. Sometimes this is just a lack of imagination and sometimes it stems from the fact that many wine writers are not familiar with some of the less appreciated, but still worthy wines. So let me be one of the few to recommend Sherry and Saké for your Thanksgiving Day feast. Both are versatile, available in a variety of styles, and will add a unique touch to the festivities. Lots of people will have Pinot Noir and Riesling on Thaksgiving, but how many can say they had a Junmai Saké or Amontillado with their turkey? These food friendly selections should appeal to your guests and give them something to talk about later. It will make for a memorable holiday. Rather than Champagne, Cava, Prosecco or such, why not toast with a Sparkling Saké? It is usually low in alcohol, only 6%-8%, which is lower than most other sparkling wines. It is commonly fruity and sweet, and is a hit at Saké tastings. Most times it comes in small, 300ml bottles so you can even try it at low cost and not worry about excessive left over Saké. Sometimes you buy inexpensive Champagne, few actually end up drinking it, and you so end up wasting much of a 750ml bottle. If you start off your dinner with some appetizers, like nuts, pickles, chips and other salty treats, consider a dry Saké, maybe a Junmai or Junmai Ginjo. If you like a sweet-style Riesling for Thanksgiving, why not consider a sweet Saké instead? A nice Honjozo, Junmai, or Junmai Ginjo, with a touch of sweetness, would be an excellent option. Just remember that the Junmai will probably be a richer style, while the Honjozo and Ginjo will be lighter. If you would prefer something a bit more earthy or gamey, then try a Kimoto or Yamahai style Saké, which are a couple of my favorites styles. And for a lighter, more delicate taste, go for a Daiginjo. For dessert, try a sweet Nigori or even a Koshu, an aged Saké, which may remind you of a Port. You don't need tiny cups for any of these Sakés, just use a regular wine glass and enjoy. Sherry is another versatile option. A chilled Fino or Manzanilla sherry would be an excellent choice as an aperitif, especially if you serve some pre-dinner appetizers, such as cheese, nuts, chips and olives. These dry sherries will also go well with any fried appetizers you might serve. These two can be found in half-bottles, and thus you have potentially less waste. Other dry sherries, including Amontillado, Palo Cortado and Oloroso, would all pair well with Thanksgiving turkey yet they don’t often receive recommendations. I think this is mainly because sweet sherry is most commonly drunk in the U.S. Not enough people appreciate the delicious flavors of these dry sherries, and how well they match with a wide variety of foods. Their flavors, commonly including tastes like nuts, caramel, vanilla, herbs, spice, and wood, which will often match well a turkey dinner. I will be drinking dry sherry, possibly an Amontillado, this Thanksgiving. The sweet sherries are more appropriate for dessert. A cream sherry can pair well with fruit desserts, such as pies, or try a sweet, syrupy Pedro Ximenez sherry with a chocolate dessert, or simply pour some over ice cream. I hope everyone has a great Thanksgiving, enjoying the company of family and friends. Be thankful for all that you have in your lives, knowing there are many less fortunate than you. Savor all of the delicious food and drink at your table. Has anyone had Sherry or Saké at their previous Thanksgiving dinners, or are you planning to have some this Thanksgiving?